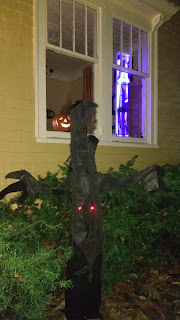 1) Purple monster with 3 eyes, very good homemade costume, kid looked much bigger than he was. 2) Pinocchio, with a nose that grows and the girl was really into her role. 3) Mad hatter, a richly detailed and colourful costume. 4) Origami deer skull, beautiful and creepy. 1) Zombies in various forms were the most popular costume. 2) Many kids took a classic character and zombified it: Dead Cat, Dead Clown, Dead Doll etc. 4) There was a three-way tie between the classics of witches, vampires and cats. 5) Skeletons suddenly faded. Last year there were 13. This year, zero. 6) A lot of dragons, including some beautiful costumes. 8) Batman still big, but spiderman fading. 9) Why are Power Rangers still so popular? 10) A growing number of Youtube and video game characters. 11) The first appearance ever, after 22 years of surveys in my neighbourhood, of a political character: the severed head of Donald Trump. 12) Almost all the parents were in costume, some of them quite elaborate. My thanks to survey helpers: Patricia Acheson and Anna Wedlock. The Moon adds a ghostly glow to the Duncan Street Halloweenscape. 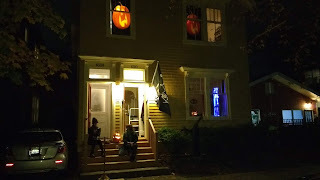 I have tracked Halloween trick-or-treaters at my doorstep in West End Halifax since 1996. This year's numbers were up significantly with some dramatic shifts in popular costumes with the dominant vampires, zombies and princess costumes all but disappearing, pushed out by skeletons and ninjas. First Caller: 6:05 p.m. Peak: 6:45 Last Caller: 8:47 p.m.
Halloween on Duncan Street: Candy and survey clipboard! 1) Dead Doll - impressive vintage clothes and terrific make-up. 2) Beaker, the Muppet character, perfect expression and hair. 3) Robot, with coloured lights, escorted by Mom, also in robot costume. 1) Most popular costume:Skeletons, in many forms. 2) Ninjas were a close second, also in many sizes and colours. 3) An increase in insects: 2 bees, 1 wasp, 1 hornet & a ladybug. 4) Dramatic fall in vampires, merely a single vampire cat compared to 6 last year. 5) A hearty increase in pirates, with a lot of impressive pirate weaponry, always good to see for an author of a history of Canadian piracy. 6) Zombies dying off, only a couple. 7) A fall-off in superheroes: no Batman, no Superman, only a few Spidermen. 9) A lot of vintage TV characters. My thanks to survey helpers: Patricia Acheson, Mary Louise Conlin, Anna Wedlock and Craig Stamp. 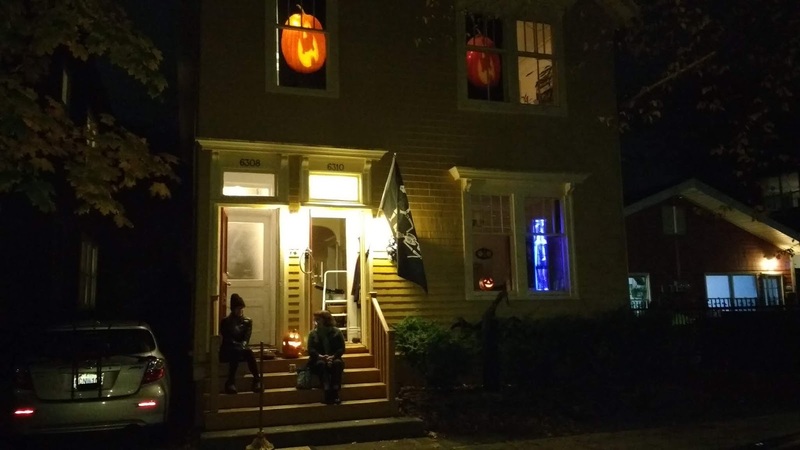 I have tracked Halloween trick-or-treaters at my doorstep in West End Halifax for 20 years. This year's numbers were down slightly but still healthy - and entertaining. First Caller: 5:52 p.m. Peak: 7:00 Last Caller: 8:45 p.m.
Our suspended spider which, from time to time, pounced on unsuspecting survey respondents. 1) Vampires tied with Ninjas. 3) The skeletons have died: one this year but five last year. 4) Zombies flourishing in several varieties. 8) Big cats flourishing: tigers, leopard, jaquar, lion. Most parents, about 2/3, were, wearing costumes, up from past years. My thanks to survey helpers: Patricia Acheson, Mary Louise Conlin, Dana Echner and Bruce MacDougall. All Images and Artifacts Copyright the Maritime Museum of the Atlantic unless noted. Watermark theme. Powered by Blogger.